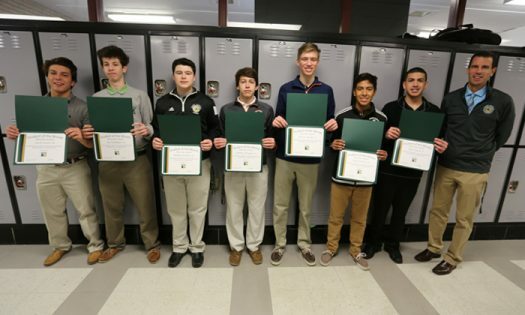 The following students have been selected as Saint Patrick High School’s Students of the Month for the month of January: Dan Agron, Kevin Ayeski, Angel Botello, Zach Cicero, Joe Dickman, Jimmy Finnegan and Bobby Fiorante. Dan is quiet and unassuming in class, but very on top of his schoolwork as far as making sure what should be done gets done. He never contributes to distractions or disruptions in class and always reaches out when he misses class, taking responsibility for his own learning, a trait that is truly invaluable! Kevin is a conscientious student who is always on top of his work. He puts effort into all of his schoolwork on top of being a dedicated athlete. There is never a day that Kevin enters the classroom without saying hello or leaves the classroom without saying goodbye and have a nice day. Angel has grown into a mature, hardworking student. He applies himself to his work, and his desire to do well shows in class. Angel works to comprehend material and better his understanding, which stands out in the classroom. Zach is a model of St. Patrick spirit. His energy and thoughtful can turn a teacher’s or fellow student’s day around. He is a leader in class, participating in class discussion as well as school functions. Zach embodies tremendous school spirit and represents all that is strong and true about being a Shamrock. Joe is one of a few polite students in his class who quite literally never disrupts or interrupts during instruction, is always where he is supposed to be, and continuously does his work. Jimmy is always attentive in class, and participates frequently. He works diligently to improve his skills in the classroom, on the field, and in the weight room. He is a model Shamrock. Bobby is always fully engaged in his Chinese class and puts his best effort into every assignment. He maintained A+ grade in his Chinese class consistently throughout the years. He made extra efforts to win rewards in the Midwest Chinese Speech Contest. He is also friendly and willing to help his classmates.